The Garmin Vivofit is an exciting new fitness band on the market. Introduced in early 2014, it is designed for both men and women seeking to get a better look into their activity level and improve upon it. With a sleek, waterproof design and features such as calorie counting, activity monitoring and personalized activity recommendations, this fitness band can help you reach your fitness goals and boost your overall wellbeing. 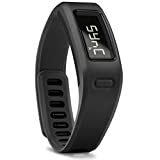 Starting at $129.99, it is a higher end fitness band that will appeal to fans of the brand and those seeking a simple interface with ease of use. As an added motivator, the Vivofit is compatible with Garmin Connect; an online community where users can share, plan and track their fitness progress. The Vivofit fitness band by Garmin offers many good qualities that will appeal to a variety of consumers. Walkers, runners and those simply aiming to boost their physical activity level will enjoy the user-friendly layout and calories burned tracker. The Vivofit will automatically remind you when it is time to get active based on trends in your activity level, making it excellent for busy individuals or anyone who needs an extra boost of motivation. Advanced athletes may not appreciate the Vivofit’s lack of features and customization. However, the Vivofit has the average user in mind and is not necessarily geared towards that market. With a very plain presentation, it does lack style points. 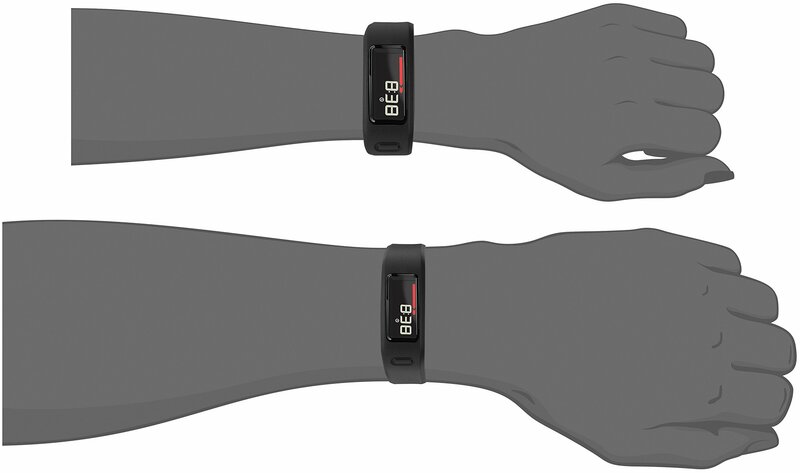 Consumers searching for a more attractive fitness band may not appreciate the lack of colors (available in black, blue, purple, and teal) and minimalist aesthetic value of it. Overall, the Garmin Vivofit has many favorable features to offer. It is ideal for anyone seeking to get a better look into their physical activity and enhance it. Consumers will hectic schedules and non-techies alike will love the minimalistic design and easy to understand interface. With activity alerts, it also serves as a personal motivator to get out and be more active. The Vivofit also gives customers instant access to Garmin Connect where they can communicate with other users and track their goals, in addition to other activities. With a calories burned tracker designed for walking and running, it is the perfect choice for runners and anyone who enjoys walking for fitness. Vivofit’s lightweight and comfortable build makes it ideal for users with wrist pain caused by arthritis or other conditions. The sleep analysis feature is an added bonus that anyone can benefit from. At an average price of $129.99, the Vivofit comes with Garmin’s reputation for building quality fitness products. Anyone seeking a reliable and quality-built fitness band for daily use should consider taking a closer look at the Garmin Vivofit.